As the title suggests, the works of Inheh Hwang combine a contemporary abstract artistic language with traditional materials. The support of the artists' panels is made of Hanji paper while the accents are from traditional Korean costumes. These latter consist of stitching and buttons made of stiff ribbon that are historically used in women's costumes. The works' expanses are painted with ink and natural color washes that in themselves can be related to traditional methods of dyeing. Korean water coloring is usually made of natural materials like charcoal, persimmon, or other mineral or plant. Having learned calligraphy as a child through her father, the artist incorporates it in her abstract works thereby enriching their meaning and morphology. Moreover, having been reared on the classics of her ethnic tradition, she won calligraphy awards. Hwang grew up surrounded by nature in an orchard with fruit and wild flowers so that she learned about the qualities of natural substances, eventually making her own Hanji paper from natural materials. 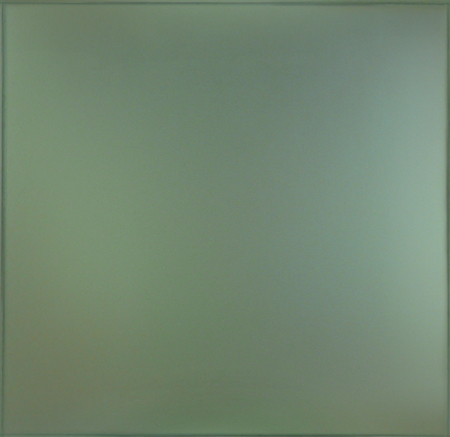 Hwang began to develop her Hangeul Abstract or GaNaDaRa series in 1994 while participating in a show taking place in Berlin the following year. Hangeul (Korean language) uses abstract characters to compose sentences which became Hwan's theme to the present. Using the shapes of her native language vocabulary circles, squares, triangles, dots, lines, she created abstract works that spoke to both past and present. Hwang appreciated the quality she was able to attain by abstracting from the letters on delicate thin Hanji whose translucency emphasized her ink and charcoal materials. 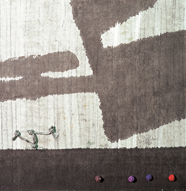 She dotted these expanses with knotted buttons to punctuate certain colors or shapes. The tradition of knotting is an important handicraft in Korean culture and reminds Hwan of her childhood when these Norigae were used by all classes to emphasize the beauty of traditional Korean costume.